If you are already successfully uploading your solar inverter's data to the detail rich online web portal of PVOutput, you will have noticed in a net metered environment, you really need to see your electricity consumption as well. The reason for this is you need to know when you have excess power, so you can use it in realtime. Otherwise you run the risk of exporting it back to the grid for little financial return. Whereas if you use it instead of importing power, your power on the roof is worth a lot more. By using your own power first you will be offsetting your normally imported electricity costs. Your solar power per kWh could be worth upwards of thirty cents, compared to six or eight cents your electricity retailer is paying you to return it back to the grid. This is why in a net metered environment it does not pay to oversize your solar system. As you can see using your electricity wisely will increase it's worth five fold! In fact to correctly size any solar pv system before installation, you really need to know exactly what you are using in the sunny hours of the day. Otherwise you or the sales person are guessing! So how do you get your home's electricity consumption data online to PVOutput when your inverter's monitoring system does not include electricity consumption? Well you simply install a electricity consumption monitoring system. 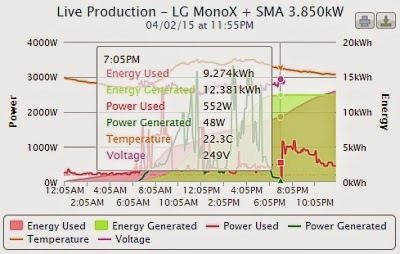 The electricity consumption data in your home will then be displayed alongside your current solar pv data. Allowing to see excess power and 'using it before losing it' for little return. The electricity monitoring solutions we offer cover more than one hardware platform, giving you slight variations of features and the benefits. More and more householders are contacting us day by day as they discover they know very little about their imported / exported power. And the only way to know this important information, is to install some form of electricity consumption monitoring system, it is that easy! And whilst you are monitoring your consumption you are going to learn ways to cut the waste. So why not take a look at our page on CHOOSING YOUR HOME ELECTRICITY MONITOR. Sep 2015 : See our addition to this post, where we discuss a great SOLAR PV MONITORING ANDROID APP suitable for all net metering environments.